It's no lie -- Big Fat Liar is a real charmer. In the sweet, kid's comedy, BIG FAT LIAR, Jason Shepherd is the consummate con man. Well, he would be if he were a man. Actually, he's a short, 14-year-old boy with extra big, blue eyes and an extra small mouth played winningly by Frankie Muniz, the star of the popular television series, "Malcolm in the Middle." Jason's paper for English class is stolen by an unscrupulous slimeball of a movie producer named Marty Wolf (Paul Giamatti). Marty, currently shooting a buddy movie (WHITAKER AND FOWL) about a cop with an actual chicken for a sidekick, hasn't had a profitable picture in a long time. But Jason's story, titled BIG FAT LIAR, looks like it will become next summer's big hit movie. Although Giamatti hams it up for all he's worth, this movie belongs to the younger actors. Well cast with Muniz is Nickelodeon's Amanda Bynes, as Kaylee, Jason's initially reluctant partner-in-crime. Together they sneak off to Hollywood while their parents are gone and they are supposed to be staying with someone else. Once in LaLaLand, Jason plots an intricate plan for revenge to force Marty to tell Jason's dad the truth about who wrote the screenplay. Although their payback scheme may not be the most original, Muniz and Bynes are such an eminently likeable duo that you'll be rooting for them and laughing. Typical of the gags is the pouring of blue dye into Marty's swimming pool. You can probably guess the next song after that episode. The PG-rated movie, which should have been rated G, doesn't contain a single crude moment. BIG FAT LIAR gets its laughs the old fashion way without resorting to bathroom humor or foul language. As THE PRINCESS DIARIES showed last year, G (or PG) movies don't have to be bland, and they can be quite good. It's no lie -- BIG FAT LIAR is a real charmer. BIG FAT LIAR runs a breezy 1:28. It is rated PG for "some language" and would be acceptable for all ages. Big Fat Liar asks the perennial question: wouldn't it be really cool if you could jump off the tram on the Universal Studio Tour and live on the studio back lot? It's a question that has amused kids since time immemorial. Well, okay, maybe not that long, but at least since the first Baby-Boomer chugged through the Disneyland Jungle Cruise and thought how keen it would be to live in the jungle with a lot of mechanical elephants and hippos. Big Fat Liar asks other questions, too. How many product placements can be crammed into one 85-minute movie? How many times can one movie plug the upcoming 20th anniversary reissue of Steven Spielberg's E.T. the Extraterrestrial? How little can a movie get away with giving a family audience for the price of their movie tickets? Frankie Muniz, the young actor from Fox TV's Malcolm in the Middle, plays Jason Shepherd, a Michigan teenager who works harder making up excuses for not doing his homework than he does at doing the homework itself. No simple dog-ate-my-homework will do for Jason; he constructs elaborate lies, then backs them up with equally elaborate alibis, in which he is abetted by his slightly reluctant best friend Kaylee (Amanda Bynes). One day Jason gets caught in a lie over a creative writing assignment, but his teacher gives him until 6:00 p.m. to turn in the story. Jason goes home and, in a sudden flash of inspiration, writes a story called "Big Fat Liar" that he's sure will get him an "A." Rushing to the school to turn the story in before his deadline, he collides with a stretch limo hauling one Marty Wolf (Paul Giamatti), a sleazy Hollywood producer in town for a location shoot. Marty gives Jason a ride to school and, after Jason has left the car, finds the story he left behind. With no story to show, Jason winds up in summer school - then finds out that Marty Wolf's next production will be none other than Jason's own story, "Big Fat Liar." But by this time, Jason has cried wolf (the pun is probably intended) so many times that no one will believe him. Jason and Kaylee take off for Hollywood to get Marty Wolf to fess up so Jason can regain his parents' respect. Sounds ridiculous, doesn't it? Well, to give credit where it's due, this much of the movie seems to play better than it sounds. But that's the best that can be said for Big Fat Liar - that for the first half-hour or so it squeaks by with the bare minimum of conviction. Once Jason and Kaylee get to Hollywood and are snidely rebuffed by the ill-tempered Wolf, they clench their teeth in an of-course-you-know-this-means-war snarl and set about getting back at Marty by clever use of his stolen palm pilot. At this point Big Fat Liar abandons all pretense to taking place in the real world and becomes a paean to Kid Power, showing our young hero and heroine using Yankee ingenuity and pure moral force to put the unscrupulous grown-up in his place. Aiding them greatly in this is the fact that everywhere they turn they run into someone with a grudge against Marty Wolf. They gather allies at every turn. Having exhausted their meager supply of invention in the first third of their film, writers Dan Schneider and Brian Robbins and director Shawn Levy simply tread water for the last hour. As Hollywood satires go, this is hardly What Makes Sammy Run?, but it doesn't aspire to be. But then, just what does it aspire to be? Big Fat Liar is dumb and sloppy, but it's not exactly corrupt. It simply seems to have been developed backwards, as if the promotion department shot a trailer for a kids' movie they figured they could sell, then hired Schneider, Robbins and Levy to expand it into a whole movie. Ironically, this seems to be how Marty Wolf himself works. Jason first learns of Marty's theft when he sees the preview trailer for his stolen story in the theater, then when he and Kaylee get to Hollywood Marty is still working on the script and hasn't even started shooting. I mentioned the best that could be said for Big Fat Liar. This is the worst: it looks like a Marty Wolf Production - that is, like the kind of movie its own villain would make. I liked it. Paul Giamatti, blue with orange hair: what part of painting an adult buffoon-blue isn't funny to a little kid? Hey, it's funny to me. Perhaps, I'm biased, I'm a fan of Giamatti. While the other critics scoffed at a little film he starred in called "Duets" - I adored it (mostly because of his talented buffoonery). Probably, even less noticed (because he was an ape), he provided the only humor and "fun" bits (aside from ol' Chuck's brilliant cameo) in the larger release "Planet of the Apes" (2001). In "Big Fat Liar," Giamatti plays a slimy LA writer/director (Wolf) who swipes a story from a 14-year-old's English paper in order to create his newest film project. Jason (Muniz), whose lies have already earned him distrust, takes off to Hollywood in order to coerce Wolf into clarifying the true ownership of ideas. Wolf is not about to be challenged by anybody (let alone a teen); hence, Jason resorts to practical jokes, booby-traps, and slapstick in order to whittle Wolf down to a desperate broken man. So there you have it, a kid harassing an adult until said adult cracks. Since Wolf's personality wins him an army of enemies (many familiar faces from TV's past), Jason finds plenty of allies. Director Levy keeps a clipping pace, always with an eye for visual fun. One shot burned itself into my memory. Paul Giamatti flustered, exhausted and dusty, stands in the middle of the desert searching desperately for a mode of transportation ... and then the sound of propeller blades as a studio chopper drops into the frame behind him. Before turning to see it, he shows us the "fight" he still has left in his eyes. This is just a silly movie, but that was a great shot. I suppose missing the beginning sequences could have been a blessing, but as it stands ... I left the theater wishing I hadn't missed them. Good Family fun, in the "Home Alone" vein. As a youngster I faced my fair share of bullies, and like the lead character in Big Fat Liar, my desire to get even with those who wronged me consumed my existence. This was before the days of Home Alone, where coming up with an arsenal of tools for payback meant combing through the dark corners of the garage looking for dad's five-iron. But now, in the post-Culkin era, every kid knows exactly what to use and where to find it when a tormentor comes calling. Big Fat Liar plays out just like Home Alone. Boy is the family outcast who is left home alone and while everyone else vacations, he proves to his parents that they can be proud of him again. This time however, the war is not waged on local turf but instead on a Hollywood back lot 2,000 miles from the comforts of home. Like those in Home Alone, the pranks in Big Fat Liar will surely please the film's target audience; however, the messages it tries to infuse with all its fun contradict the premise of the story. 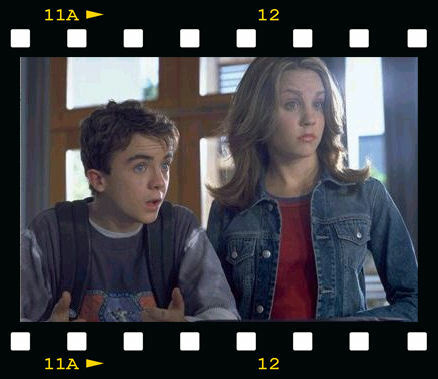 Frankie Muniz (TV's Malcolm in the Middle) is Jason Shepherd, an undersized junior high school misfit who uses a clever stock of lies to get himself out of a myriad of jams. As the film opens, Jason's story for English class is due but because it is unfinished, he uses an elaborate fabrication to fool his teacher. The truth is soon discovered however, and Jason is given a small reprieve to finish his assignment. He drafts a story called "Big Fat Liar." Jason rushes across town on his sister's bike to bring the story to his teacher but is struck by a limousine carrying the mean-spirited Hollywood producer Marty Wolf (Paul Giamatti). Wolf reluctantly agrees to help Jason but in the chaos of the situation, Jason drops his story on floor of the limo and doesn't realize it's gone. He has no assignment to give to his teacher and as a result, he loses his dad's trust and must enroll in summer school. The Wolf is desperate to salvage his failing career so he steals Jason's story and re-works it into a major motion picture. When Jason and his friend Kaylee (Amanda Bynes from The Amanda Show on TEENick) catch on to Wolf's scheme, the pair travel to Los Angeles to find the Wolf, and through a series of pranks, seek to enact their revenge. Kids will love this movie. Watching two of their favorite television stars beat up on a big, bad adult will keep them in their seats and laughing up every moment. The film has implausible and silly moments, but that's the genre. There are numerous scenes though where Muniz and Bynes are not directly involved in the pranks, but they are coordinating them from off screen. Giamatti actually gets most of the screen time along with a supporting cast that carries out the revenge orchestrated by the kids. Though the comedy is juvenile, adults will still be amused by the antics. They will especially find the scenes that take place on the Hollywood back lot interesting (such as the chase sequence at the end of the film goes through three different sets as the characters turn new corners and find themselves in a western showdown, a snow covered NYC alley, and then a sun-drenched Spanish villa). However, adults who are looking to Big Fat Liar to provide a social commentary to their kids on the virtues of telling the truth will find the film comes up well short. In fact, the message Big Fat Liar tries to get across about the truth not being overrated is contradicted by the countless lies and deceptions Jason and Kaylee concoct to execute their plan. Amazingly, at the end of the film, Jason's dad is proud of him for actually doing his homework, yet he has had to cut his vacation short and fly to L.A. to pick up his deceitful son who has spent thousands of studio dollars to pull off his many lies. Somehow, I don't think too many dads would be proud of such behavior, especially when the studio sends him the bill! "Big Fat Liar" is a big fat pain. A noisy, annoying boy-who-cried-wolf revenge comedy displaying zero imagination and even less charm (despite the presence of usually likable Frankie Muniz as the title perpetrator), the Universal release simply marks time by amusing itself with its various onscreen antics. Directed and written by a couple of Nickelodeon alumni (Shawn Levy and Dan Schneider, respectively), the PG picture is obviously aimed at shorter attention spans, but even that rating-deprived younger demographic could do itself a big fat favor by steering clear. Muniz plays 14-year-old Jason Shepherd, a perpetual fibber whose latest distortion of the truth lands him in hot water with his schoolteacher (Sandra Oh), who gives him three hours to come up with his overdue English term paper. In a hurry to get the finished product -- which he has called "Big Fat Liar" -- to his teacher, Jason has a run-in with a limo carrying ultra-obnoxious Hollywood producer Marty Wolf (a frantically over-the-top Paul Giamatti), and, in all the confusion, he drives off with Jason's paper. Cut to an "Access Hollywood" segment profiling Wolf and his next project, called, yep, "Big Fat Liar." Unable to convince anybody that Wolf has stolen his idea, Jason and his equally bratty friend Kaylee (Amanda Bynes) sneak off to Hollywood to confront Wolf and get him to fess up to Jason's parents by any means necessary. As it happens, Wolf's production office is conveniently headquartered at Universal Studios, and everything that follows must be among the most shameless instances of self-promotion in recent memory. It wouldn't be surprising if the film's working title was "Universal Studios Tour: The Motion Picture." That might have been more forgivable if Schneider and Levy had been able to dish out something more creative than the endless barrage of tired, in-your-face acts of studio-lot vengeance (oh look, there's the "Psycho" house!) orchestrated by Muniz, Bynes and a growing list of Giamatti's enemies. As it plays, there's really no reason for audiences to muster up much interest in the barely written characters. While the kids work with what they're given, Giamatti -- who was so effective in "Private Parts" and Todd Solondz's latest, "Storytelling" -- has chosen to use the standard kid-flick defense for going wildly over the top. The best thing you can say about his performance (in a picture that also boasts turns by Lee Majors and erstwhile "Urkel" Jaleel White) is that he exhibits virtually no trace of vanity. Production values are unremarkable, displaying all the telltale signs of a tightly budgeted rush job. Jason Shephard (Frankie Muniz) has an aversion to working hard at school and has learned that a good, whopping lie can make his life a little easier. But, his luck has finally run out. He fails, for the first time, to con his English teacher (Sandra Oh) and must turn in an important mid-term paper in a matter of hours or face having to attend summer school. Inspired by the threat, Jason does the thing he is best at and spins a yarn in record time. He thinks he's in the clear, but a collision with the limousine of an unscrupulous movie producer will change his life completely in "Big Fat Liar." Jason, forced to take his little sister's bike to make his deadline, runs into the limo of movie producer, Marty Wolf (Paul Giamatti), who is in Michigan shooting a film. With his ride now bent and useless, Jason begs a lift with Marty and we catch a glimpse of what the boy, himself, may become if he doesn't stop his constant lying. He inadvertently leaves the important paper, a story titled Big Fat Liar, in the car and fails to pass the course and, much against his will, must attend summer school. Months later, he makes the most out of the situation and heads to the movies with his best friend Kaylee (Amanda Bynes). While watching the coming attractions, Jason realizes the story being told is straight from his mid-term and it is produced by none other than Marty Wolf and it is titled "Big Fat Liar." Jason sees this as a way to get back the trust of his parents, especially his dad (Michael Bryan French), and sets off with Kaylee to go from Michigan to Hollywood to confront Marty with his affront and have the nasty producer call Jason's dad and confess, with no other strings attached. The arrogant Wolf disdains the idea and refuses to honor the teen's simple request even though he admits to stealing the boy's story. Now, it's war as Jason schemes to force Marty to his will but is thwarted every time by the wily producer even when he finds himself dyed blue with bright orange hair. Along the way to revenge, Jason finds that the people who work for the egotistical, demanding Wolf also have a grudge and the wheels of vengeance are put into high gear. The far-fetched, old-fashioned Hollywood fantasy story (14 year-olds are always traveling halfway across the country to prove a point, aren't they?) is merely a framework to hang the comedy upon. Normal things, like eating and sleeping, don't hinder Jason and Kaylee in the quest. Need a place to stay? The wardrobe and prop department at Marty Wolf Studio will do just fine. This is the kind of entertaining unreality that seems a bygone thing but fits "Big Fat Liar" quite well. Marty Wolf is unlikable enough to cause the ranks that join Jason's cause to swell and, as the climax approaches, it becomes a military operation broken into four phases ? Surveillance, Takedown, The Twist, and The Payback. Jason must pit his smarts and newfound belief in truth and honesty against the selfish meanness that is Marty. Acting is uniformly even from the stars to the supporting cast. Frankie Muniz, with his wide-eyed, innocent looks and comfort level in front of the camera, makes his Jason a likable rogue who knows how to think on his feet. With a character that can come up with a lie at the drop of a hat, and this being a young teen flick, the inevitable "the truth shall set you free" theme hits you over the head, but Muniz holds his own as Jason. Veteran character actor Paul Giamatti has not, until now, had the chance at a lead role. As the shallow, selfish, nasty, arrogant Marty Wolf, Giamatti gets to play a cartoon-style bad guy and brings it over the top. Marty is the kind of guy you love to hate but the actor imbues just a tiny sliver of humanity into the producer so you don't want him totally destroyed. Giamatti puts his all into the blustering physicality of his character. Nickelodeon TV star Amanda Bynes is cast in the sidekick role as Jason's best buddy Kaylee. The young actress fills the part very well and shows a great deal of comic and acting talent; particularly with her several phone conversation bits. Kaylee is the voice of reason for Jason and helps keep his hare-brained schemes in check. Amanda Detmer, as Marty's put upon and harried assistant producer, Monty, whom he constantly pressures to fix the things that he screws up with his lies, happily gets her own reward when she gives Jason the dirt he needs on Marty. Donald Faison is amusing as Frank Jackson, the chauffeur who teams up with Jason and Kaylee when he finds out that they are out to get the man that ruined his chances as an actor. 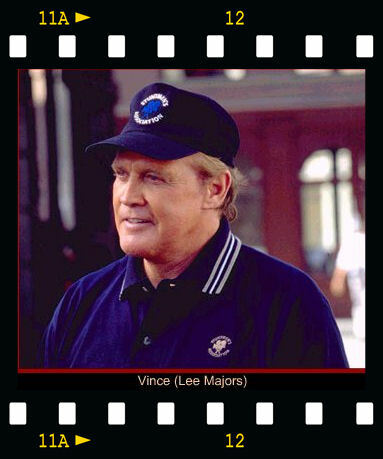 Icon Lee Majors makes an appearance as Wolf Studio's stunt coordinator, a veteran who has, up to now, put up with the crap that Marty dishes out with vigor. First-time helmer Shawn Levy does a no frills job in pushing the clichéd but entertaining story along briskly. It must be nice to get to make a film on the Universal Pictures back lot and use that wonderful locale as part, even a character, of the film. This gives rise to the inevitable clothes-changing montage and music video romps around the movie lot. The tech staff joining the helmer does yeoman's work and crank out a well-crafted if ordinary flick. "Big Fat Liar," with its young TV stars, comic bad guy and goofy fun, is aimed squarely at the older kids/younger teen audience. With its plethora of site gags, harmless vengeance and comic antics, it should strike pay dirt at the box office. I wouldn't recommend it as fare for adults without kids (unless you yourself are a real kid at heart) but there is enough father and son stuff and messages about honesty to make it light-hearted, fantasy family fare. I give it a B-. airbags, and now as a stunt coordinator he exudes a fatherly image to all the stuntmen he works with. photographed, and accompanied by some of composer Christophe Beck's best music for the film. As part of the elaborate "Phase Four" plan to waylay Marty from the studio, the copter sequence shows Lee at his heroic, confident best. Although the crate's failure is staged by movie technicians, Vince knows to make it look and sound like the thing is really going to crash -- and so does Lee. The scene where Vince and Marty touch down and then make a heroes' walk toward the studio is done in this slow-motion style as if they were the first astronauts heading for the moon capsule -- another nice touch by director Shawn Levy. have teen and preteen children of their own. Just about every reviewer stateside cited Lee's appearance inthis film, with most reviewers citing his adult appeal to drawmore moviegoers. One reviewer I don't recall was less thankind, though, calling him "paunchy". But I believe Lee carriedhimself proudly here. We want to thank Robair of AMANDAmonium for reviewing this for us!